This relationship dynamic between Jay Z and J. Cole has always been interesting to me. I know Jay never backs anyone he doesn't totally believe in, but for a minute it seemed like he was holding back a little on Cole. I know Cole has loads of respect and I'd assume appreciation for Jay, but he's honest about not having always been a fan. So, it's rare that we get moments like this. When we see them interact, for me.. it shows that at the end of the day, they both see greatness in one another. 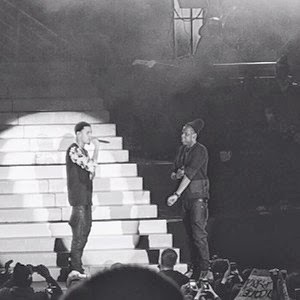 Jay Z crashed Cole's bday bash at Madison Square Garden performing a couple of his hits to a crowd of obvious fans. You can tell Cole was in heaven as he sat back watching the greatest to do it rap on HIS set. To make the moment even more special, Jay Z paused after the first song to give Cole a very special gift. Every one who knows anything about Jay Z and the Roc knows the importance of the Rocafella chain, and it's significance to being signed to the team. So, in a moment J. Cole will never forget, he is given Jay Z's original Rocafella chain. Truly chaining day for Cole. Sweet!